We revisit a prior episode of the podcast with this redux from March of 2011. 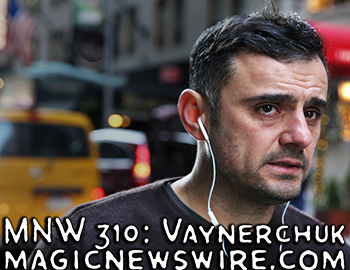 We highlight a non-magician, New York Times bestselling author and social media expert Gary Vaynerchuk. Gary has been featured in The Wall Street Journal, GQ, and Time, has appeared on Late Night with Conan O'Brien and Ellen. He also makes regular appearances on Fox News, MSNBC, CNN and the major network news outlets. Vaynerchuk has been described as "the first wine guru of the YouTube era", "the wine world's new superstar", and by Rob Newsom, a Washington State wine maker, "outside of Robert Parker, probably the most influential wine critic in the United States". Gary is also a best selling author of three books focused on the concept of personal branding and the power of social media and the internet in doing so. He joins us on the Magic Newswire to discuss his latest book "The Thank You Economy." Gary says, "I feel that we're living through the biggest culture shift of our time. The internet, itself, is 17-years-old. It's just hitting the social part of its life. It's just like growing up. As you get to 13, 14 and 15, you want to go out and go to parties. That's what's happening right now! The internet is growing up." Find out why this should matter to you!